In 2018, the Smithsonian Food History Team is taking a close look at regional foodways and why they matter. From our monthly live-cooking demonstration program Cooking Up History to our fourth annual Food History Weekend this November, we are researching, writing, and talking about the power of place and the changing dynamics of regional foodways across the country. 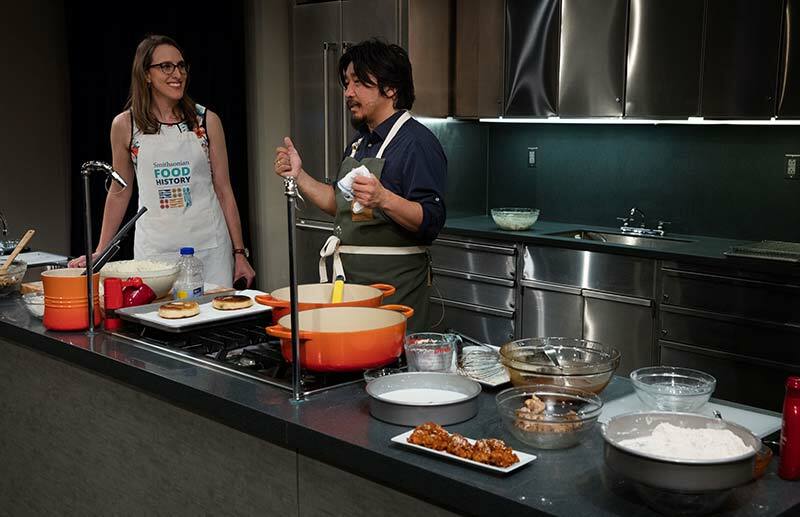 Chef Edward Lee and food historian Dr. Ashley Rose Young prepare Southern dishes and talk about American history during the National Museum of American History's live cooking demonstration program, Cooking Up History. This June, as summer humidity cloaked D.C., we focused our attention on a hot topic: the history and evolution of Southern cuisine. Like okra slime in a bowl of gumbo, questions about Southern food swirled around the minds of the Smithsonian Food History Team as we focused on this year's annual theme. How have diverse communities in the American South shaped the region's food culture throughout U.S. history? How are chefs and home cooks rethinking what it means to prepare, serve, and eat Southern food today? How is their understanding of this regional cuisine different from what we typically think of as "Southern" food? And how do new ingredients, flavors, and spins on traditional Southern dishes end up on our tables? While I have been researching and writing on food history and the American South for many years, I wanted to get a quick picture of what people today consider to be Southern regional foodways. We spoke with museum visitors and sent an open call on Twitter asking this question: "What dish or cooking technique do you think best represents Southern cuisine and why?" Answers poured in—from a high school history teacher, a culinary historian, and even a self-identified "independent rum evangelist," among others. What many consider to be the canon of Southern dishes appeared in their replies: fried chicken, collard greens, cornbread, fried okra, biscuits, and barbecue, to name a few. While unsurprising, our crowd-sourced list of Southern dishes provided us with a baseline from which to understand the ways in which chefs and home cooks are improvising, experimenting, and riffing on traditional Southern foods. One such visionary, Edward Lee, was our guest chef for June's Cooking Up History program. We tasked him with helping us understand the nuances of Southern cuisine today. This was a fitting topic for him, given his passionate exploration of Southern food at his restaurants in Louisville, Kentucky, and in the D.C. metro area, and also in his writing and television appearances. 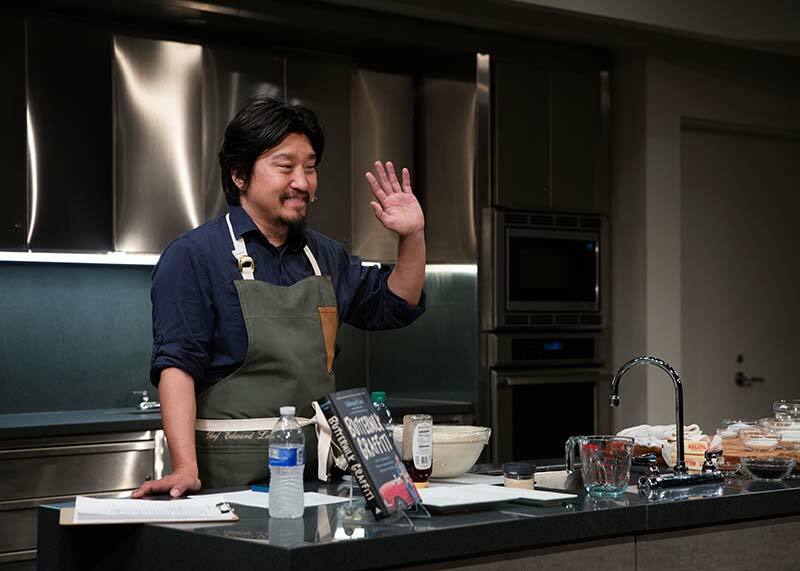 During the cooking demonstration, Chef Lee made two dishes that reflect his style of merging Korean and Southern culinary traditions: "Dirty" Fried Chicken and Korean Doughnuts. Chef Edward Lee during Cooking Up History. 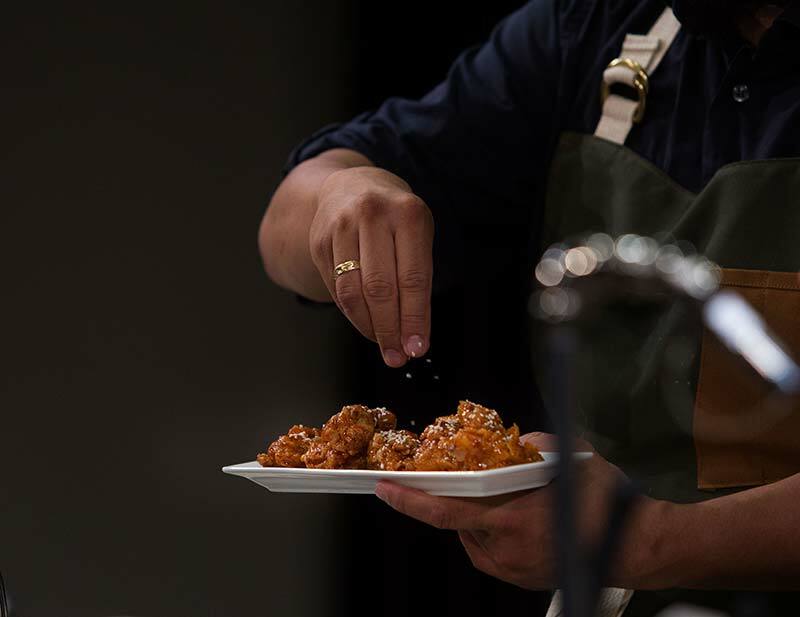 In addition to providing museum-goers with tips for making the super-light and crispy fried chicken (brine and poach the chicken first), Chef Lee reflected on issues ranging from appropriation to immigration—all of which have impacted Southern food culture. Chef Edward Lee's "Dirty" Fried Chicken prepared during Cooking Up History. While talking about the variations in Southern cuisine, Chef Lee acknowledged the fear among some cooks of stepping on the proverbial toes of long-held traditions. For them, fried chicken is sauceless and the addition of a tangy, Korean-inspired hot sauce (a key element in Chef Lee's "Dirty" Fried Chicken) is an unfathomable addition to this Southern staple. What if traditional fried chicken gets lost in the process of innovation and improvisation? Lee argued that we should abandon such fears and uncertainty in the kitchen, saying that if "food traditions are strong," they will endure. Traditions have been around for generations, and they will be around for generations to come. Chef Lee further maintained that we can't dwell in the past, or be married to the idea of a static traditional food culture. As he states in his new book, Buttermilk Graffiti, "If we live in nostalgia, we will strangle the possibility for a future." What Chef Lee recognizes is that Southern food culture is not static. In fact, it's quite dynamic and responds to changing environmental, demographic, and social conditions. During the cooking demo, Chef Lee highlighted some of the new dishes that have developed in big cities and small towns in the modern South. He mentioned Delta tamales in Mississippi and Viet-Cajun crawfish in Houston—both of which have emerged from the mingling of immigrant food culture with Southern cuisine in the 20th century. Chef Lee noted that although some people continue to hold on to the belief that Southern food is marked by cornbread and collards, sentiments will eventually change and Americans will come to recognize dishes like Delta tamales and Viet-Cajun crawfish as part of the canon of Southern food. As he stated during the cooking demo, "What's on your neighbors' table will be on your table eventually. It just takes time." 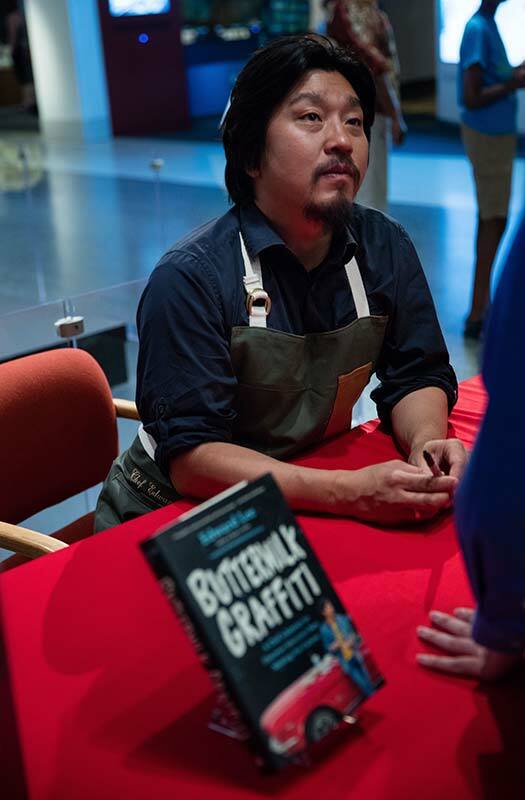 Chef Edward Lee signing copies of Buttermilk Graffiti after Cooking Up History. With Chef Lee's observations fresh in our minds, the Smithsonian Food History Team continues to mull over the questions we posed about food in the American South and regional foodways in America more broadly. Plan to attend the Food History Weekend Roundtables and Festival, November 2-3, and explore regional foodways across the country. Dr. Ashley Rose Young is the historian of the American Food History Project at the Smithsonian's National Museum of American History and is also the host of Cooking Up History. Cooking Up History is generously supported by Hilton, the program's lead sponsor, as well as Wegmans Food Markets, Inc., and Sur La Table.